BP1Kit transmission shift cable kit allows you to quickly and easily repair your shift selector cable by replacing the bushing. The kit replaces the bushing on the interior end of the cable located at the base of the gear shifter. This shift cable bushing repair kit allows you to fix your BP1Kit shift cable bushing very easily. It takes about 2 minutes and comes with a lifetime warranty. It's made from better material than the factory bushing so it'll last longer. When the shift cable came lose on my Toyota I first went to a local parts store and they told me I could only get the part from the dealership. I went to the dealership and they only sold the whole cable as one unit for $670! Not only did this product save me a small fortune, it was the easiest repair I think I've done in my life! Had a hard time finding this bushing into I ran across this website and it worked like a charm. I found others but they were not the correct size. This was a great product and so easy to install. It was a great help and got here fast! Great low-cost fix for broken shifter cables. 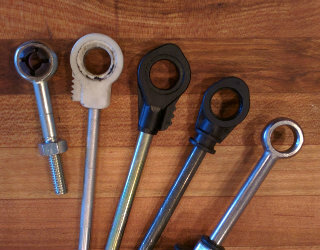 These bushings are a great alternative to buying a complete shifter cable from the dealer. Saves on labor costs as well! Customer service, sent picture of package, sent new bushing. Installed bushing, problem solved. This bushing repaired the inside linkage connection. You do have to remove the knee bolster and the center console to access the shifter cable. Over an hour labor just to get where you need to be. A 30 second repair after that.